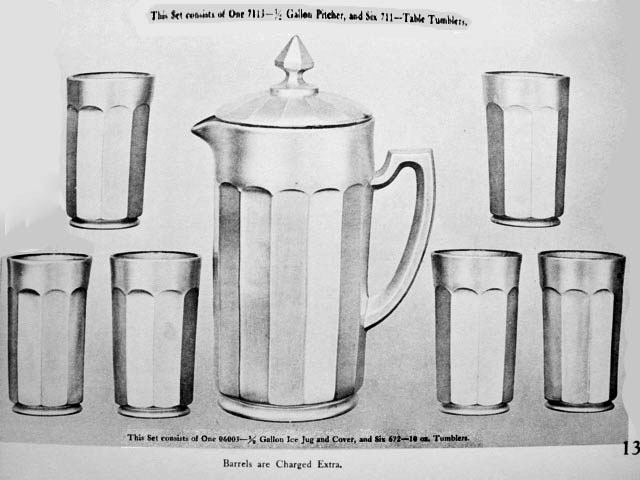 Imperial Catalog photo - CHESTERFIELD Water Set. CHESTERFIELD Water Set: Tumblers are 5” high. The water sets are scarcely ever found in complete status, indicating heavy use during the era of productivity. Sets were manufactured in white, red, celeste blue, and teal, in addition to the marigold, but in today’s world, red elements are virtually non-existent, and should a collector be fortunate enough to own a complete set in any of the colors, they should consider themselves most fortunate! 7.75 in. tall x 7.5 in. diameter top. White CHESTERFIELD Compote - stretch. #600 - Lg. 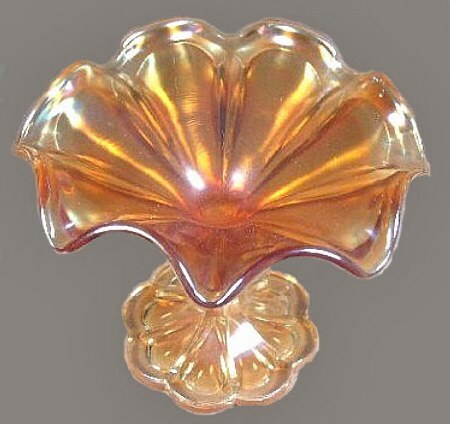 CHESTERFIELD Compote in Marigold. 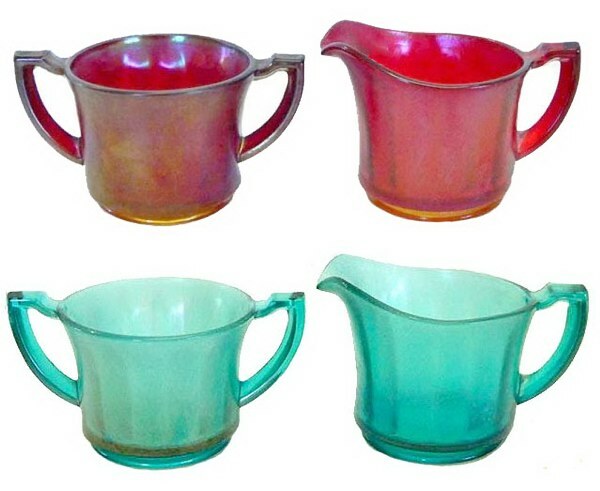 CHESTERFIELD Compote(s): Both the 5” and the 7 ¾” sizes were produced in marigold, clambroth, smoke, celeste blue, white, red and teal. Large CHESTERFIELD (Compote) - Smoky white. CHESTERFIELD Handled Compote: Seems there is always something not previously discovered. 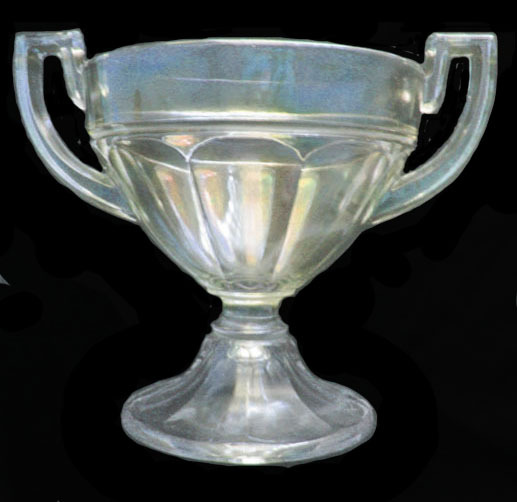 While attending the 2013 ACGA Convention, Doug Siska proudly displayed this unusually large compote which is believed to be part of the Chesterfield line. 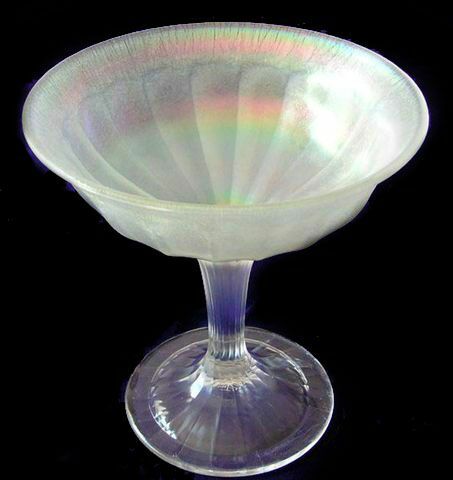 The unusual smoky white iridization rather indicates it may have been a test piece which never achieved production level. It is 6” in height. Width handle to handle is 8 ¼”. Width of bowl: 5 ¾” across. Width of foot: 4 ¼” across. Doug said he had purchased the compote in a mall. CHESTERFIELD Open Sugar - White stretch. Catalog #104A, pg. 43A - Chesterfield Breakfast Set - stretch. 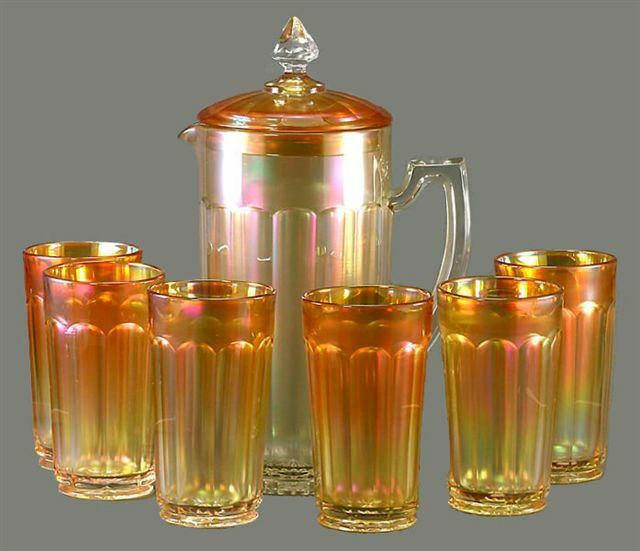 CHESTERFIELD (design) Breakfast Set: Breakfast sets are occasionally found in marigold, red, teal and white. Overall, they are considered to be “stretch”. 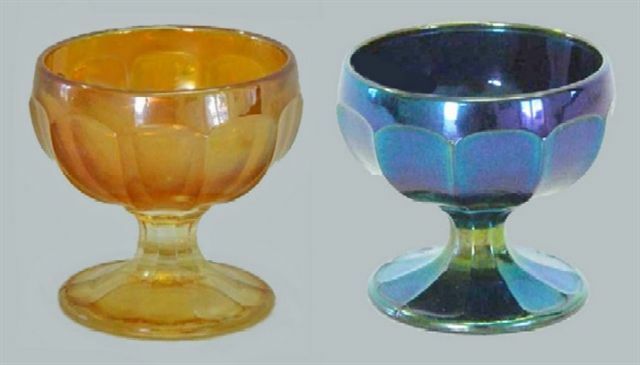 However, many carnival glass collectors buy them. Granted: Carl O. Burns does not indicate in his Imperial Book that there are such within the Chesterfield design. Imperial Catalog 104A displays Colonial Ware-highly polished, on page 42A. Those breakfast set items are #700 ½, have scalloped top edges and handles sloping upwards to a point. 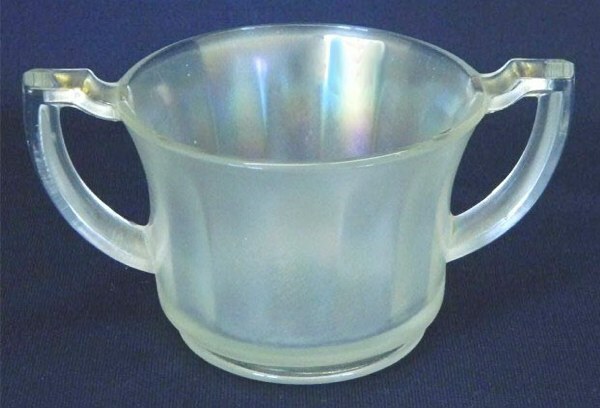 Colonial Ware - highly polished, on page 43A, displays a spooner and creamer numbered X600 ½. These display the Chesterfield handles. The base (minus lid) of the sugar, also shown in the ad, is the same size as the spooner. Realizing the methods used by glassmakers, it seems that when using these moulds for stretch glass, the wooden paddle was placed into the center of the object while on the snap, forcing the sides to expand, thereby smoothing out the original lines creating the panel sections seen in the ad, thus creating the “stretch effect”. None-the-less, the design came from the Chesterfield line since the flat-top handles remain. CHESTERFIELD Salt Cups in Marigold and Purple. CHESTERFIELD Open Salt Cup: This tiny salt cup is also a part of the #600 Chesterfield line. For many years it was known only in marigold and signed with the Imperial Cross. Seeck Auctions sold a purple Open Salt having no iron cross imprint, during the April 2013 HOACGA Convention. It is the first such example reported. COLUMBIA Rose Bowl - Mgld. sold 1-07- Remmen Auction. COLUMBIA vase - purple - sold for $55.April 2010. 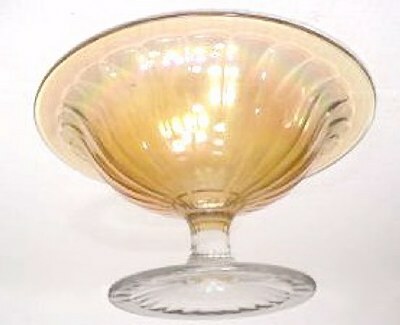 COLUMBIA Compote in Marigold - scarce in this color and in purple. It is 4.75 inches tall and spreads to 6 inches across top. COLUMBIA: Whimsey Plates are seldom seen. They are 7 ½” high, having a spread of 9”. Clambroth and marigold are known colors. 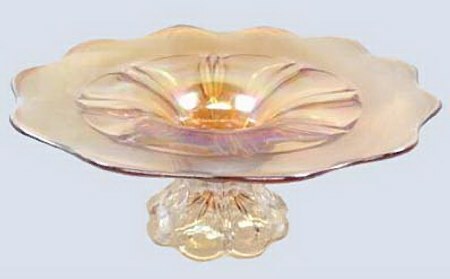 The Rose Bowl shape is found in marigold, along with a 7”-8” bowl in marigold. Ruffled compotes in marigold and purple are scarce. Vases are perhaps the most often seen shape, but certainly they are not plentiful! They are 5”-7” tall and are found in marigold, purple, helios, and smoke. but rejoices in the truth; bears all things, believes all things, hopes all things, endures all things. whether there is knowledge, it will vanish away. For we know in part and we prophecy in part. But when that which is perfect has come, then that which is in part will be done away. When I was a child, I spoke as a child, I thought as a child; but when I became a man, I put away childish things.